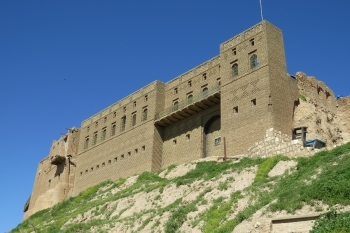 The Erbil Citadel is a fortified settlement on top of a 20-30 meter high 'tell'. It has a long settlement history, dating back to at least the Chalcolithic period and gaining prominence as Arbela during the Assyrian period. The citadel is uninhabited since 2006 and undergoing reconstructions. Most of the remaining structures date from the 19th and 20th centuries. The oldest surviving building is the hammam (1775). The perimeter wall of the citadel is not a continuous fortification wall, but consists of the façades of approximately 100 houses that have been built against each other. Erbil Citadel is the first WHS within Iraqi Kurdistan, a region that may become an independent state within the foreseeable future. The site is labelled as the “the oldest continuously inhabited settlement in the world”. By this it rivals better known places such as Byblos, Damascus and Jericho. Claims like this are impossible to verify, but Erbil’s origins are certainly ancient. A better differentiator is the fact that it’s a town citadel (inhabited by people) and not a military structure. I visited the Citadel on a Sunday morning in March 2014. I was part of a small Dutch tour group on a 10 day-tour of Iraqi Kurdistan. We entered the Citadel from the back (the North Gate) and had to pass a guard there. Our Dutch tour leader had arranged for a visit with one of the local guides, but upon entering he was nowhere to be found. That did not prove to be a big problem, as you can walk around freely in the main area. And with the help of a caretaker we were able to open some doors and duck beneath various stretches of red tape. We also met an Iranian backpacker who was sightseeing on his own. So Erbil Citadel is now definitely open for visitors, there were also many locals around for a Sunday stroll. I had no clear expectations of what there is to see in the Citadel’s interior. In its heyday it was a “labyrinthine network of narrow pedestrian alleyways”. Despite the still ongoing restorations / reconstruction, the ugly 20th century additions (water tank, paved axis road between North and South gates including a speed bump) dominate the view. The characteristic tree-like pattern of streets spreading out from the main gate unfortunately is not noticeable anymore. In the town center lie the old hammam and the main mosque. The mosque seems to be the only place within the Citadel that is actually in use. It has a pretty tiled minaret, but otherwise is modern kitsch. Behind it are a few elegantly restored courtyard residences. One of those will be turned into a Cultural Center. There’s also a textile museum but that was closed for the day. At its best moments the Citadel reminded me of Itchan Kala, the old town of Khiva (Uzbekistan). Itchan Kala is much more atmospheric though. The Erbil Citadel clearly has suffered from a long period of decay. 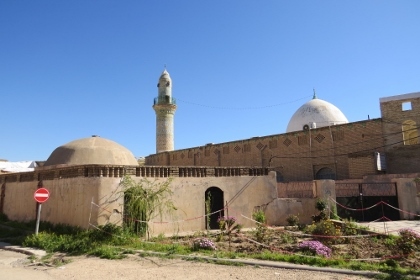 And although it technically might be “confinuously inhabited” for 7000 years, most people had moved out to better properties in the modern areas of Erbil by the 1960s. They kept one family in all the time to keep it inhabited. Also, refugees have squatted there recently. So is this a worthwhile inscription? The sympathy vote has been high for this one. The Turkish WHC delegate even cried out loud “Lets’s help the Iraqi people in these difficult times!”. Its very old origins are undoubted and the story of the Kurds provides an interesting angle. It is the first WHS in Kurdistan, and with Turkey putting forward both Mardin and Diyarbakir during the coming 2 years this hints at acceptance of the Kurds in the international community. There’s a lot to say about the way things are restored (although some of the work was sponsored by Unesco itself) and also there's a lack of coordination on how to process further. The town now is being restored to its late 19th century situation – nothing hints at the Assyrians or other early settlers. A lot of the buildings are still in ruins and I have not seen a sign when “it” will be finished. This is quite typical for Kurdistan where a lot of things are “80% finished”. We all know that the last 20% is the difficult part of any project. I visited Iraqi Kurdistan in October 2018. 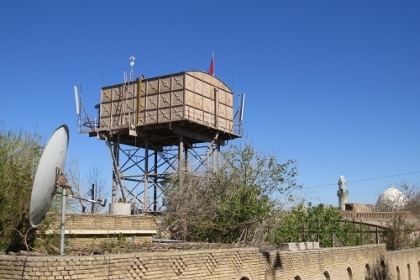 The ancient Citadel of Erbil has possibly been occupied for 7,000 years, since the fifth millennium BCE, making Erbil one of the oldest continuously inhabited areas in the world, although that’s somewhat contrived. 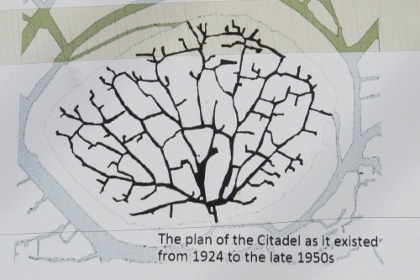 In 2007, all but one of the 840 families living on the citadel were evicted prior to the start of a restoration project — a single family has been allowed to remain to ensure that there would be no interruption in the seven millenniums of unbroken inhabitation of the mound. The Citadel lies right in the city center of the Iraqi Kurdistan capital of Erbil, which can be reached by numerous international airlines (mainly from Europe and the Middle East). Ancient Anatolian cultures: In the early part of the 3rd Millennium BC, the Hurrians from Asia Minor were the first to establish Urbilum (Erbil).